This spacious detached villa sleeps 6 adults with provision for 1 in a fold up bed and young child in a travel cot. The villa is furnished to an extremely high standard. Downstairs the villa has a fully fitted kitchen - spacious lounge/dining area with French Doors opening onto the fully enclosed back garden and private heated (optional) pool. There is also a downstairs toilet, washbasin and storage cupboard. The lounge has satellite TV, home cinema system with surround sound. The fully landscaped garden is child friendly & has a private heated pool, patio area with dining table, chairs, a barbeque, sun loungers and a pergola for those who prefer the shade. The garden also has a two hole putting green ( putters and golf balls provided) and a basketball net. Upstairs are 3 large bedrooms - one double with ensuite, 2 twin rooms and a bathroom. Two rooms have French Doors opening onto a small 'Juliet' balcony and one has a sea view. All bedrooms are furnished to a very high standard. The spacious roof terrace has panoramic views of the sea, sand dunes, Los Lobos, Lanzarote & the mountains and has sun loungers so you can relax and soak in the year-round Canarian sunshine. The complex has a large communal pool. Beautiful beach 5 minute drive away. The villa also has a complimentary high speed WiFi internet connection. Casa Bonita is a spacious oasis where you can just sit back and relax. We especially love the enclosed back garden and pool. It is so peaceful and relaxing to spend a few hours reading or practicing those putting strokes on the 2-hole putting green. The views from the roof-top solarium are breath-taking. The Island is relatively small and the villa is an ideal location to head off on day trips over the mountains or you can reach the very southern tip of the Island in about 2 hours. The whole island is a water-sport paradise be it wind surfing, kite surfing, snorkeling, fishing etc. Our aim is to provide as many facilities as possible to ensure you have a relaxing, memorable holiday on this sun-drenched Island. The villa is provided with all the essentials to make you feel at home. There is a private, heated (optional) salt water pool in the fully landscaped garden. The kitchen has a toaster, kettle, sandwich maker, coffee maker and plentiful supply of crockery, cutlery, glasses, pots and pans. The views from the roof terrace/solarium are breath-taking, giving memorable views over the Parque Natural sand dunes, Lanzarote, Los Lobos and the Mountains of Fuerteventura. The latest attraction locally is a new 9 hole golf course which was opened to the public in June 09. This golf course is just a ten minute walk from the villa. Just back from a fabulous week spent at Casa Bonita. Jer was great to deal with from the start of booking process to the directions and instructions for access to the property. The property is easy to find and a great spot to use as a base to explore the island. The days were always finished off with a dip in the heated pool. The property has everything you would need and plenty for the kids to do. The property is close to a supermarket with a few restaurants nearby however given the lovely weather and the pool we had a BBQ most nights. I would defintely recommend this property. We waren dit jaar voor de vijfde keer in villa Casa Bonita van Jer en Mary. Alles wat een vakantie aangenaam kan maken is hier aanwezig; prima bedden, complete keuken en heerlijk terras met zwembad. De villa ligt op een rustige plek in Corralejo direct naast de duinen, slechts 5 minuten met de auto van het centrum of 30 minuten wandelen. Dat wij hier al vijf keer zijn geweest, geeft aan hoe tevreden wij zijn. En als er iets nodig is, is altijd Jim dichtbij om te helpen of je doet het per mail naar Jer. De mailcontacten voor vragen en afspraken via Jer verlopen uitstekend, snel en correct antwoord of advies. Wij zijn tevreden en gaan volgend jaar weer. What a brilliantly equipped and family friendly villa. Thanks to Lesley & Jim for their assistance when required. We all had a fantastic holiday, Thankyou. Lovely & quiet-everything we needed was there for us. 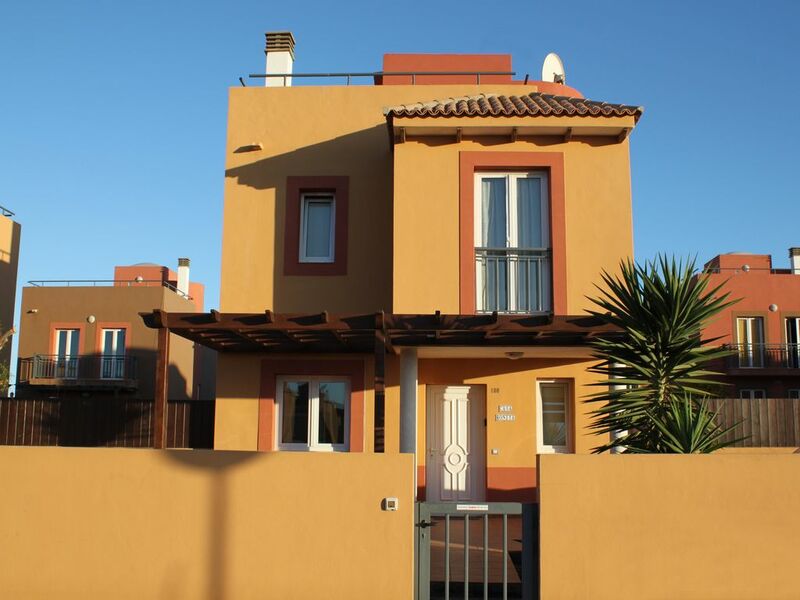 Great holiday-clean & tidy villa with fantastic views. Thank you for your great review and delighted that you enjoyed your stay at our villa. The villa is in a peaceful location but is less than 0.5 miles from Mercadona, the largest supermarket in Corralejo. The property is clean and well-presented and catered for all our needs such that we didn't need to trouble the caretakers. The double bed is very comfortable. We ate twice at the Hotel Mahoh in Villaverde. The restaurant is charming and the food excellent at a surprising low price. For the outward bound types, there are 2 lovely walks from here, one to Lajares and one to Parque Holandes. We would certainly recommend Casa Bonita for an excellent family holiday. Great house, big and well equipped. Garden also large (and sunny) enough for our two kids to play in as well as to have some time for yourself because it's a safe place to play, especially with the safety fence around the pool. All questions and the booking is handled swiftly by the owner. Thans for staying in your lovely house ! Glad you enjoyed your stay at Casa Bonita and thank you for your nice review. The fully enclosed garden with the pool safety fence makes the property very secure - especially for families with young children. Corralejo is a lively holiday destination with a wide variety of shops, restaurants and bars. Originally a small picturesque fishing village, it still retains its atmosphere and charm. There are a number of sheltered sandy beaches just off the town centre or the beautiful expanses of Flag Beach just a couple of kilometres outside Corralejo provide plenty of choice for the committed sun-bather. Activities available locally include all kinds of water sport, fishing trips, boat trips, golf (championship course 35 minutes away), cycling, tennis and horse riding. The Baku Waterpark is a 20 minute walk from the villa, which in addition to the water slides includes a ten pin bowling alley, crazy golf and play area. The harbour area has a host of cafes and bars which are ideal to relax and watch the boats and ferries coming and going. Take a round-Island drive and experience the stunning scenery from the miles of sand dunes in the North to the stunning mountain scenery in the East.